We’d love your help. Let us know what’s wrong with this preview of Hiding in Sunshine by John Stuart. This taut thriller follows a family’s eleven-year odyssey on the run under assumed identities, where survival skills are paramount, but so are friendship, cooperation, and resilience. HIDING IN SUNSHINE celebrates one family’s abiding courage in the face of abject treachery -- and a young girl’s faith in the triumph of the truth. To ask other readers questions about Hiding in Sunshine, please sign up. Good book!! Although it is written by a father/daughter duo, the book is not your "Goodnight Moon" sort of book. It's about cyber technology, stolen identity, witness protection, survival, affluence, and intelligence. I was hooked right from the start and couldn't wait to pick it up each time I had a moment to read during this busy Christmas holiday season. There were times towards the middle of the book when I just wanted to discount the Stuarts' incredible intelligence and call them a little n Good book!! Although it is written by a father/daughter duo, the book is not your "Goodnight Moon" sort of book. It's about cyber technology, stolen identity, witness protection, survival, affluence, and intelligence. I was hooked right from the start and couldn't wait to pick it up each time I had a moment to read during this busy Christmas holiday season. There were times towards the middle of the book when I just wanted to discount the Stuarts' incredible intelligence and call them a little negligent because of the stupid things the main character couple did seemingly putting their children in danger. I was relieved at the end of the book to find out why these things happened as they did. As in the case with current fiction, the authors oftentimes leave the readers hanging as to several details. The Stuarts answered my questions, thankfully. Sometimes you don't want to be left hanging especially when the subject is so modern day important. I couldn't help but think that this book was so current/futuristic that it brought to mind the fall season tv series "Revolution". Quote: p. 233 - "Ayn Rand brings the best and the worst animal instinct out in humans. Well, excuse me, I aspire to be further evolved ethically than that. I really believe that Ayn Rand is the Marilyn Monroe of philosophy--all seduction, little substance." To be honest, I wasn't sure what to expect after learning that the book was written by a man and his teenage daughter. What I got was a smart, fast-paced technological thriller and an ending with a surprising twist. The worst thing I can say about this book is that some of the computer jargon went right over my head, but that's hardly the fault of the authors. Cyber crime at its ugliest! Ever wonder what happens with all that data out there? Who can actually access it? What would happen if it all got in the wrong hands? What if those you trusted became your enemies? What if no one was there to be in your corner when your family's lives were on the line? Gavin and Lisa Brinkley lived a well-earned lifestyle of the rich. Gavin is a computer genius who has developed security programs for companies and financial institutions all around the globe. He is abl Cyber crime at its ugliest! Ever wonder what happens with all that data out there? Who can actually access it? What would happen if it all got in the wrong hands? What if those you trusted became your enemies? What if no one was there to be in your corner when your family's lives were on the line? Gavin and Lisa Brinkley lived a well-earned lifestyle of the rich. Gavin is a computer genius who has developed security programs for companies and financial institutions all around the globe. He is able to analyze and second guess what a hacker might do, therefore stopping them in their tracks. Now he has become the target of a terrorist group, as have many of his colleagues. Quickly he is put into the Witness Protection Program and must go on the run with his wife and two daughters. When there is a leak at the FBI, they must run again, losing themselves in rural America, living off the grid completely, learning to survive by their wits and their grit. After eleven years of hiding, one small snapshot taken by his daughter will change everything when cyber terrorists bring the country to its knees. The story has depth, it is creative, fast paced, and full of action while still showing a family that sticks together and protects each other, no matter what they have love and faith in each other on their side. The dialogue is full of humor and intensity, each character having a distinct personality, complete with 'normal' flaws that made what they did believable, but still larger than life! The wrap up at the end was beyond 'justice served!' It left me smiling big time and wanting more from this father/daughter writing team!! I received this book as a free gift from Influenster a few days ago with no real requirement that I had to do anything with it, but I love to read and I love free books so I gave it a go! Based on the cover, I would have probably passed this book by in the store, but I am so glad that I got this as a gift so I could give it a chance, because it was well worth it! The book, "Hiding in Sunshine" is written by John and Caitlin Stuart, who are Father and Daughter. The Father is into technology, the d I received this book as a free gift from Influenster a few days ago with no real requirement that I had to do anything with it, but I love to read and I love free books so I gave it a go! Based on the cover, I would have probably passed this book by in the store, but I am so glad that I got this as a gift so I could give it a chance, because it was well worth it! The book, "Hiding in Sunshine" is written by John and Caitlin Stuart, who are Father and Daughter. The Father is into technology, the daughter into writing. The book starts out with this family of four. Gavin and Cindy and their two young daughters, Jessica and Rebekah. We are introduced to their world where the father is pretty much a technological genius who is very well off and their family is pretty happy and secure. Then we see the family get thrust into the Witness Protection Program, by a group of hackers called the Enterprise, who it appears are after him because of his knowledge. They go from living this wealthy lifestyle to a life of being on their own and relatively unknown with media now a danger to them. This book utterly chilled me to the core when I read about how the world started going haywire with these hackers breaking into bank accounts and stock markets and stealing. What chilled me the most was how relatively easy this really would be for people to do. The ending of this book was very satisfying, I will say, and there's an unbelievable twist I didn't not see coming! I received this book from Influenster as part of their voxbox. If I had been in the bookstore the cover wouldn't have drawn me in and I would have probably looked right over it. Being an avid reader though, I gave it a go! By reading the synopsis I was intrigued to see what this father/ daughter duo would write, especially since it is hailed as being a suspense novel. The first few chapters are pretty slow given that the authors try to paint a vivid portrait of the main characters and their lives I received this book from Influenster as part of their voxbox. If I had been in the bookstore the cover wouldn't have drawn me in and I would have probably looked right over it. Being an avid reader though, I gave it a go! By reading the synopsis I was intrigued to see what this father/ daughter duo would write, especially since it is hailed as being a suspense novel. The first few chapters are pretty slow given that the authors try to paint a vivid portrait of the main characters and their lives. They spend so much time on it that it is almost painfully slow. It would have been nice to include some of the details later throughout the story to keep the reader's interest. The premise of the story is intriguing, but to someone who doesn't have any computer knowledge it may be a little much delving into the world of computers and hackers. For me working with computers I found it interesting and slightly frightening how easy it may be for someone to hack my or anyone else's information. This book had such potential to be a really great thriller. The cyber crime element is such a relevant issue for today but unfortunately it was just paced in such a slow and tedious manner that I had to literally force myself to keep reading and finish it. I think I'm just not used to this type of writing style. I felt like I was reading a report or essay at some points. Some paragraphs were so conversational that it was like they were written in the way that people would talk when face to face w This book had such potential to be a really great thriller. The cyber crime element is such a relevant issue for today but unfortunately it was just paced in such a slow and tedious manner that I had to literally force myself to keep reading and finish it. I think I'm just not used to this type of writing style. I felt like I was reading a report or essay at some points. Some paragraphs were so conversational that it was like they were written in the way that people would talk when face to face with each other rather than in the usual story-telling format. As for the main characters, well I found myself not connecting with any of them due to how stiff and impersonal they all seemed. No-one had any real endearing traits to relate to and they all seemed to be very stiff when talking to each other even though they were supposed to be a close family with no-one else left in the world to turn to except each other. The entire book was just following the family around America as they tried to live under the radar after being threatened and put into witness protection. There was no real action to speak of and there definitely were no thriller elements that made me want to keep turning the pages. I feel that it was such a shame that the writing style let this book down so much. It really did have all the plot elements of being a great story but just wasn't executed very well at all. I loved this book! I hadn’t actually read the description ahead of time so I really had no idea what to expect and I enjoyed that complete element of surprise. From the beginning, I was hooked and couldn’t really stop reading, I NEEDED to know what was going to happen to this family. Gavin and Lisa Brinkley are an affluent couple who try to lead quiet lives; Gavin has numerous highly lucrative patents but they try to stay off the radar and prefer to avoid media attention. As a couple that is not I loved this book! I hadn’t actually read the description ahead of time so I really had no idea what to expect and I enjoyed that complete element of surprise. From the beginning, I was hooked and couldn’t really stop reading, I NEEDED to know what was going to happen to this family. Gavin and Lisa Brinkley are an affluent couple who try to lead quiet lives; Gavin has numerous highly lucrative patents but they try to stay off the radar and prefer to avoid media attention. As a couple that is not very well known or rather well recognized even within the technology community, they are shocked to learn they have become the target of a kidnapping! And even more shocked when they realize that they are being put in the Witness Protection Program for their own safety. Hiding In Sunshine follows the couple and their two young children as they are shuffled off into the Witness Protection Program and are forced to take on new identities and begin a new life away from everything they know especially technology. This was an excellent read by John and Caitlin Stewart. Set in the electronic and computer driven times it shows what could happen when bad guys try to overcome many of the worls's processes driven by computers and electronics. Think of banks, the government, lives that contain information on computers etc... A riveting story and one that unfortunately, tells us just what could happen in the near future. I enjoyed it. J. Robert Ewbank author "Wesley's Wars" and "John Wesley, Natural Man, and the This was an excellent read by John and Caitlin Stewart. Set in the electronic and computer driven times it shows what could happen when bad guys try to overcome many of the worls's processes driven by computers and electronics. Think of banks, the government, lives that contain information on computers etc... A riveting story and one that unfortunately, tells us just what could happen in the near future. I enjoyed it. J. Robert Ewbank author "Wesley's Wars" and "John Wesley, Natural Man, and the Isms"
The story line was an awesome idea and sounded incredibly intriguing, but it was written in a way that was next to impossible for me to get into. Plot lines didn't make sense, it seemed very forced, and very much long an extremely young young adult novel. This had so much potential but sadly just didn't make it. Great book. Intense, drama and real life tech world scenarios. Book made me think how easy I put my personal information on the web making it easy for hackers to get the information. I read the book over a weekend because I couldn't put it down. Interesting storyline and great twisted ending. If you like interesting, intense, drama books then Hiding in Sunshine is for you. I thought this book was a very good one. It was a very eventful one, telling the story of Rose Campbell's life. It is filled with lots of action and detailed scenery. I enjoyed the book a lot and would definitely read a sequel if there was one. Hiding in Sunshine by John and Caitlin Stuart was an overall good read and turned into a real page turner. It started off slow but quickly picked that pace up and became a nice thriller novel. I would recommend this book to anyone who enjoys thrillers and up and coming authors. Living lives of quiet affluence in a historic, suburban Boston town, Gavin and Lisa Brinkley had no idea how quickly and decisively their lives, and those of their two young daughters, could be upended. A series of events - a mysterious break-in at their home, some menacing tailgating on the highway from Boston, a startling visit from an F.B.I. agent warning of an imminent kidnapping attempt - leads to the family's abrupt uprooting from its comfortable existence into a terrifying new existence on the run, under new identities. This taut thriller by a father-daughter team follows the eleven-year odyssey of an American family on the run, in hiding through the mountain states of the American west, where survival skills and living off the grid are paramount, but so are friendship, cooperation, and resilience. 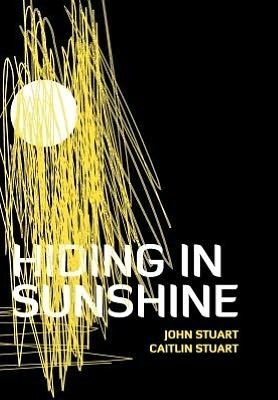 Hiding in Sunshine by John and Caitlin Stuart, a Father and Daughter team was a surprising read. I love thrillers and whilst not quite into cyber-security, I could follow most of the details, certainly enough to relate to the stealing of personal details for illegal gain. Albeit, this compelling novel covers theft on a much grander scale. The first few chapters takes the time to build up the characters, their lifestyle and strengths, which come into play as they adapt from being a very affluent family to living off the grid. The technology entrepreneur and high tech inventive talents of Gavin and international banking skills of Lisa, in addition to the puzzle solving abilities and intelligence of the young Becky play a big part in the final twist to the story. Without spoiling the plot, this gripping story had you suspecting everyone particularly when the FBI could not protect you and almost anyone could be in league with Zerind Roku Kazac. The scale of the treachery, small and large, entwined with the international cyber-security thefts kept it pretty much well paced. Could the smallest slip be the start of being discovered? The dialogue between Gavin and Cindy, at times was pretty heavy almost like brain storming but required to keep the reader abreast of the events. However, I did get a bit confused with details of international banking and patents, I thought I’d missed something but it all became clear in the end. I didn’t see the final twist coming so a big thanks to the authors. Won this book in a Goodreads.com giveaway! I REALLY wanted to like this book. I sincerely did. I had cover love for it, the summary was exciting, there's a secret organization, there's conspiracy, and computers and bank robberies which you think would make it modern. And in a way, I felt that this story was handled to make it look as realistic as possible. That means every possible angle was explained, every piece of terminology, every move the characters made. Explanations are important so that Won this book in a Goodreads.com giveaway! I REALLY wanted to like this book. I sincerely did. I had cover love for it, the summary was exciting, there's a secret organization, there's conspiracy, and computers and bank robberies which you think would make it modern. And in a way, I felt that this story was handled to make it look as realistic as possible. That means every possible angle was explained, every piece of terminology, every move the characters made. Explanations are important so that readers can grasp what is going on but good grief, sometimes it felt like it took forever. This is why in movies you have the computer people saying "I just hacked into the mainframe" instead of explaining what they're doing step by step. IN FACT, in some movies they begin to explain before someone else cuts them off because honestly, for entertainment purposes, 'ain't nobody got time fo' that!' (quote the internet meme...) And even though I did enjoy the fact that the characters names kept changing, it was realistic and confusing enough to be interesting, but honestly, every time they felt something or did something it had to be explained in a long winded paragraph. Yes Lisa, that's terrible, your husband could have been unfaithful. Oh NO Lisa, he would NEVER leave the kids. Of COURSE he loves you Lisa. And Gavin for that matter sounds like the PERFECT man, oh no, he can do no wrong! It gets tiring very quickly, especially when the the action sputters to a stop after the family first begins in wit-sec. NOTHING happens for AGES on end, just constant fear from the parents and ominous news about the organization that's after them. I ended up putting the book down one night and I never picked it up again because I couldn't motivate myself to get back into that world. This is why I'm writing the review 2 months later because I had to give it a chance, but that ends today. Gavin is a wealthy inventor, a winner in the lottery of life, who moves with his family from California on the West Coast of America to Concord, an historic town in New England, on the East Coast. The narrative belabours the benefits of personal wealth although it can be read as a dissection of unthinking entitlement. There is some risk of boring less advantaged readers and losing the sympathy for the protagonist which (presumably) is intended. The character looks like a cowboy hacker in a demon Gavin is a wealthy inventor, a winner in the lottery of life, who moves with his family from California on the West Coast of America to Concord, an historic town in New England, on the East Coast. The narrative belabours the benefits of personal wealth although it can be read as a dissection of unthinking entitlement. There is some risk of boring less advantaged readers and losing the sympathy for the protagonist which (presumably) is intended. The character looks like a cowboy hacker in a demonstration to prove to sceptical bankers that their security is imperfect. It's reckless to hack into a bank account with only an implied verbal contract of permission - individuals have been jailed for less and a verbal permission can dissolve before a court. When the family fled to another state I didn't find it plausible that a wealthy family could hide in public in the United States. Driving on the highway, shopping at a mall, walking in a public square, using self-service machines, there are cameras everywhere in most states. Government agencies and corporations use computers to identify the people in a photograph; miscreants can access those records illicitly - or purchase them legally in many cases. Some of the steps taken to hide were excessive but this is plausible for a normal family - they don't know exactly what the Enterprise can do nor how to go undercover. As alarming as they sound I found the explanations of what hackers can do in the first half of the story plausible. The fictional highest level of the administration is still fighting the last generation's war inventing a threat from neo-Cold War Russian hackers. In some ways this reads like a Great American Novel. You have family, moral dilemmas, extramarital love, death, a depiction of a ruthless and parlous contemporary United States. Are sentences like "Emma pouted and sulked off." inspired or doggerel? Italics for headlines? The military-style language (fitting the "wartime" theme) doesn't always meet the ambition of the novel. In a disquieting finale, the family attempt to turn the tables on their erstwhile hunters. The culmination runs ahead of the action, belatedly explained by the characters in the final chapter. This was a very enjoyable book. It was written by a father-daughter combination. The book is very easy to read and it makes you stop and think. The country's financial institutions are being cyber-attacked and is making quite an impact. There is a financial war going on and the authors show its impact on the confidences placed on just the basic institutions. The book opens your eyes to the real world we are living in. The story is about a family and what happens when identity theft hits. they were on their own with no one to be on their side. They pulled their boot straps up and fought to regain their lives. Cyber crime is evil. There is so much data out there, personal stuff, government docs and more. What if the wrong people get hold of it? Those you think are your friends and you can trust, are they really? Or are they enemies? Gavin and Lisa Brinkley are among the rich, well earned, but rich. He is a genius in computers. Now himself and some of his co workers have been targeted by a terrorist group. Gavin and his family go into a protection program and go on the lam. They find themselves running again when a leak in the FBI happens. They are now living and losing themselves in Rural America, surviving by shear guts and brains. They hide for 11 years and then the terrorists bring the country down.. The story is fast paced, interesting, edge of seat reading at times, humor at times, love and I could go on. Emotions in this action filled book are everywhere. Another thing I liked is that the author did a wonderful job of giving each character their own personalities, along with their bad points. The book was entirely believable. It does make you stop and wonder. What if this would happen to me? I would recommend this book to everyone. It is a great read. I would like more from this father-daughter writing team. Good work! I received a complimentary copy of this e-book from NetGalley on behalf of the author and the publisher for this unbiased review. I would like to say I am an avid reader and love thrillers, psychological thrillers, etc. My favorite authors being Dean Koontz, James Patterson, Clive Cussler, among others. Hiding In Sunshine is a well thought out book written by a father/daughter duo. While a bit skeptical on how their writing styles would "mesh", they seem to have done a fairly good job. The book is about Gavin, Lisa, and their two daughters that get caught up in a dangerous and deadly turn of events. They must learn to ada I would like to say I am an avid reader and love thrillers, psychological thrillers, etc. My favorite authors being Dean Koontz, James Patterson, Clive Cussler, among others. The book is about Gavin, Lisa, and their two daughters that get caught up in a dangerous and deadly turn of events. They must learn to adapt to new environments and situations- going from a very affluent neighborhood to "small town USA". I will not give any spoilers to the book. The book starts off slow. Quite slow, in fact, but giving an in depth look into each of the characters. Part of it, I would even deem unnecessary, as in the drawn out "flirtation" of Cate. Ok, Cate liked Gavin and they were good friends- but 16 pages dedicated to the backstory? I was nodding off. I am all for well "seasoned" characters and even like to get a sense that I know who they are. Just don't get carried away with it by trying to fill up pages and/or word count. By page 100, there was a little more action, albeit covert. It amps up a little more here and there throughout the rest of the book. Spine chiller, no. Page turning thriller, no. Interesting read, yes. Just be prepared for it to be slow. My chief complaint about the book is that it seems to be very stiffly written. When reading the book, you get a sense of reading a college thesis with some action thrown in. Everyone speaks so properly and perfectly you would expect them all to be English majors. I enjoyed the book as a whole and would recommend it to others. It was a little slow reading for me but the premise was good. Gavin Brinkley, wife Lisa and their two daughters were very well off, with Gavin being a genius in his field of IT, science and anything requiring the knowledge of same. The family income was from patents of seventeen different success stories over the years, which kept them very well, so that the mansion they moved to in Concord was well within their means. The lives of luxury, of a private school for their eldest daughter, four vehicles, Lisa’s jewellery, and anything else they wanted or needed Gavin Brinkley, wife Lisa and their two daughters were very well off, with Gavin being a genius in his field of IT, science and anything requiring the knowledge of same. The family income was from patents of seventeen different success stories over the years, which kept them very well, so that the mansion they moved to in Concord was well within their means. The lives of luxury, of a private school for their eldest daughter, four vehicles, Lisa’s jewellery, and anything else they wanted or needed came to an abrupt and sudden end, with the FBI on their doorstep, whisking them away into the Witness Protection Program, with their minder telling them to not trust anyone, as their very lives were in terrible danger. So began their lives on the run, as for the next eleven years they learned how to stay off the radar, keeping in front of the danger, changing everything about themselves; plus their previous lives were never to be accessed again. The danger was always there, the fear the family felt was never far from the surface. Moving to Montana seemed safe enough, and they tentatively began to settle in, with the children in school, but the frustration was beginning to show. I struggled with this book a little. The story didn’t seem to flow, the characters at times seemed stilted and unnatural. I found myself unable to empathise with them, and there was a lot, a very lot, of seemingly irrelevant (and boring) information. The plot felt good, the storyline had promise, but the execution lacked conviction. I would like to thank NetGalley and the publisher for my copy of this book. I really wasn't sure what to expect from this book from the start; the topic seemed interesting enough but I'm really not into the whole tech crimes aspect that were central to the book. The fact that it was written by a father/daughter team was appealing and the premise (family on the run) seemed like something that I might enjoy. I really wanted to like it but in the end, this book just wasn't for me. I found the pace of the book to be too slow. I must have picked up the book a dozen or so tim I really wasn't sure what to expect from this book from the start; the topic seemed interesting enough but I'm really not into the whole tech crimes aspect that were central to the book. The fact that it was written by a father/daughter team was appealing and the premise (family on the run) seemed like something that I might enjoy. I really wanted to like it but in the end, this book just wasn't for me. I found the pace of the book to be too slow. I must have picked up the book a dozen or so times before I made it through the first several chapters. It felt like there was too much time spent setting the stage without anything actually happening. The tech bits were boring to me and although I understand some of it was critical to the plot of the text it seemed like much of it could have been simplified. Much of the text was bogged down in (what I viewed as) unnecessary detail (things that didn't contribute to the plot development). After the first 50 pages or so the pace picked up a bit and made for an overall enjoyable read, albeit a bit predictable at time. For me, it ended up being a book worth finishing but not worth reading again. A decent first effort from these authors; I'd be interested to see if they give book venture another go. First of all, the characters are all 100% flat and not developed at all. It’s like they didn’t even try. Everyone was characterized by exactly one (or maybe, maybe two) traits. Caitlin is smart. Lisa is frustrated. Gavin is brilliant. Blah blah blah I really wanted to like this book. The premise was so interesting, and I love me a good thriller. I was also intrigued by the fact that this was written by a father-daughter team, and I thought that was kinda cool. But this, frankly, was anything but. Hiding In Sunshine was written by a father daughter team, John and Caitlin Stuart. It is centered around one family who leads an extremely comfortable life, the father having great success with patents for his technological inventions. Their life gets suddenly turned upside down when they are told they are kidnapping targets and need to go into hiding. The premise sounds interesting, but the story did not hold my attention like I had hoped, and at times the writing was awkward for a novel. Multip Hiding In Sunshine was written by a father daughter team, John and Caitlin Stuart. It is centered around one family who leads an extremely comfortable life, the father having great success with patents for his technological inventions. Their life gets suddenly turned upside down when they are told they are kidnapping targets and need to go into hiding. The premise sounds interesting, but the story did not hold my attention like I had hoped, and at times the writing was awkward for a novel. Multiple times I felt more as if I was reading a high school essay. Sometimes, the story just seemed to stop, and paragraphs of explanations or character analysis would take place instead. After certain incidents occurred, the authors would spell out exactly what the character must have learned from that, putting into words an overarching life theme of sorts. While there is often a theme or lesson that can be taken away from reading a novel, it is much better to let the reader do that than slow the action to explain it in the book; readers can infer the meaning themselves. I received this book from Goodreads First Reads program. I wanted to read it, I wanted to like it, but I just couldn't. The book started slow. Strong maybe, vivid descriptions, but slow. When a new character was introduced, we learned way too much about their back story. I felt like it took forever to bring us to the promised action. But when we finally got there, I just didn't feel it. The authors' focus on setting and description seemed to just go by the wayside and we and the family were expec I received this book from Goodreads First Reads program. I wanted to read it, I wanted to like it, but I just couldn't. But when we finally got there, I just didn't feel it. The authors' focus on setting and description seemed to just go by the wayside and we and the family were expected to just believe it right away that they were targeted for kidnapping (though there was very little evidence to support this). And I just couldn't. But I pressed on, wanting to like this book. I didn't. After more nothing happened (or if something did happen it was off camera and only described to us) and we were expected to believe more of the unbelievable, I skipped around to see if it got better. I can't say for certain if it did or not, but it appears as though the denouement is a whole lot of telling not showing. Which makes me glad I stopped when I did. If the payoff is a *dialogue* between two characters about how it was Ms. Scarlet with the candlestick in the conservatory all along, I would have been very angry at plowing through the first 200+ pages. This book isn't really a thriller. Fast paced it is not. It is hard to feel sorry for family that has to go into hiding, while they whine (externally or internally) about losing their first class life for a quiet, internet free middle class life. They spend 11 years in (terror) but do nothing about it but complain for the majority of the book. I read it hoping that it would pick up, but found that the book is one long rant. A rant against the government. A rant against internet privacy rights. I This book isn't really a thriller. Fast paced it is not. It is hard to feel sorry for family that has to go into hiding, while they whine (externally or internally) about losing their first class life for a quiet, internet free middle class life. They spend 11 years in (terror) but do nothing about it but complain for the majority of the book. I read it hoping that it would pick up, but found that the book is one long rant. A rant against the government. A rant against internet privacy rights. I found it like trudging through tar laden mud. I only kept picking up the book in hopes that something excited would happen, only to put it down again of boredom and disappointment. The Father Daughter writing team was a great selling point. However it feels as if the book was written with the authors switching off on writing chapters. Every other chapter (almost) was pleasant to read, but then the next would be boring and hard to get through. I suspect the Daughter has the better and less rant worthy writing skills. If this is the case, she needs to write books without her father. Truly boring and unlikable characters with the exception of the oldest Daughter. When I read the description of this book and the back jacket, I was worried. I am not the biggest fan of techie pieces or thrilling mystery type pieces. I am more a fan of big, complex plots with numerous characters and twists. To be honest, I was afraid it was going to be a little cheesy. Boy was I wrong! Although the story was slow to start, once it picked up the plot was thrilling and enthralling. The incorporation of the government memos and the side stories that build up the main story reall When I read the description of this book and the back jacket, I was worried. I am not the biggest fan of techie pieces or thrilling mystery type pieces. I am more a fan of big, complex plots with numerous characters and twists. To be honest, I was afraid it was going to be a little cheesy. Boy was I wrong! Although the story was slow to start, once it picked up the plot was thrilling and enthralling. The incorporation of the government memos and the side stories that build up the main story really pulled me in and made this book enjoyable for me. I even got a few plot twists towards the end that really made the book exciting. I do have some annoyances. Mainly with the ending of the book. While the beginning chapters seemed to drag on, the ending chapters were short and ended abruptly. I felt more like the narrator was just listing the events instead of telling the story. Lastly, I could tell the transition in writing between the two authors. It was not enough of a difference to detract from the story, it was noticeable. Overall, I give this book 4.7 out of 5. I highly recommend it to everyone! I even made my husband stop reading Catching Fire to read this book, and even he likes it and we like totally different styles of writing. Hiding in Sunshine is the work of a father and daughter duo who reside in the immediate area where these fictional events transpire. John Stuart is a successful high tech entrepreneur.